Susmita and her husband were farmers in rural Nepal. They worked daily in the fields, growing potatoes to earn a living and feed their family. Suddenly, on the afternoon of April 25th, 2015, a devastating 7.8-magnitude earthquake destroyed their house and much of their village. They traveled 12 hours to Kathmandu, where they began living in a tent in an urban displacement site with hundreds of other displaced families. Far from their home and their fields, they found themselves homeless, jobless, and dependent on relief provided by non-governmental organizations (NGOs), local Buddhist monasteries, or other generous donors. In the displacement camp, Susmita’s husband began drinking during the day and beating her at night. She thinks this is because he is unemployed and depressed. Maya, 11, from Dhading district doesn’t know anything about her parents. She has been living with her relatives since she was very young. After the earthquake, her relatives took her to a displacement site, where they all lived under tarps. Soon thereafter, Maya’s relatives left for a nearby city, leaving Maya alone to collect relief materials. She gathered all the useful items she could – food, non-food items, clothing – and gave them to her relatives when they would briefly return. On most days, she was all alone. Radha, 15, from Sindhupalchok district, fled with her family from her village to a displacement site in Kathmandu. The site was crowded and only a piece of fabric separated the living quarters inside families’ tents. Her mother and father never had the most affectionate relationship with each other, and suddenly after they started living in the displacement site, her father began behaving strangely towards her. “What shall I do if my father forcefully touches me in the night?,” Radha asked an NGO worker that visited the site. These are just three of the stories from the tens of thousands of women and girls who visited Female Friendly Spaces in the aftermath of the the catastrophic earthquake that hit Nepal on April 25th, 2015 in which nearly 9,000 people were killed and over 893,000 homes were either damaged or fully destroyed, forcing traumatized survivors to sleep in fields or in haphazardly set up displacement camps. Of the internally displaced, slightly more were female than male. This trend held for casualties as well: more women and girls died than men and boys, partly because of the gendered roles that disproportionately assign women to household chores in this conservative society– meaning that at the time of the earthquake, women were more likely to be inside houses that collapsed. In the days after the disaster – the first of over 400 small earthquakes that continue to this day – the government of Nepal and the international community activated the humanitarian cluster system, a coordinated response mechanism that is often utilized to help countries deal efficiently and effectively with conflicts and natural disasters. Humanitarian and development organizations joined with Nepal’s Department of Women and Children to form a Protection Cluster and Gender-Based Violence Sub-Cluster, amongst other issue-specific groups. To address women’s and girls’ needs, over 40 international and Nepali NGOs established Female Friendly Spaces (FFSs) in the 14 most seriously affected districts of Nepal. These spaces served as a mechanism for NGOs and the Department of Women and Children to reach women and girls who needed urgent relief as well as longer-term support, and to deliver messages about health, rights and resources to those who had never had previously had access to such knowledge. Some NGOs operated independently while others partnered with local health posts – if the posts still stood after the quake – to distribute health and sanitation supplies as equitably and inclusively as possible, making sure to seek out elderly, pregnant, lactating, single, and socio-economically marginalized women. Humanitarian crises impact women and men differently: gender roles and power dynamics may change in the wake of a disaster; and women and men engage in different manners with relief providers. Humanitarian organizations have long understood the necessity of establishing spaces that provide safe zones to women and girls In disaster-affected areas. After Nepal’s earthquakes, women reported a decrease in time spent sleeping and resting and an increase in time spent fetching water, caring for dependents, and in their perception of being at risk of violence. As a result, FFSs have been operationalized in Nepal, Iraq, the Philippines and Jordan to respond directly to crisis-affected women’s needs. The issues that women and girls bring to FFSs can also give service providers insight into the broader post-disaster problems experienced by entire communities: trauma, physical insecurity, increased alcohol abuse, inequitable access to humanitarian aid, and socio-economic and socio-cultural divisions. In FFSs, women find a place to vocalize these problems, perhaps for the first time in their lives. A woman-run, Kathmandu-based Nepali NGO called Apeiron was one of these NGOs to team wth local health posts. 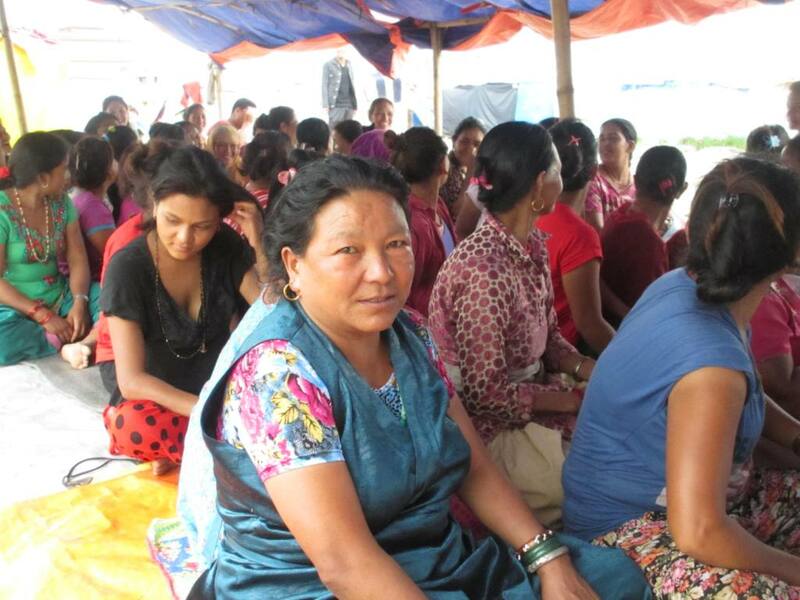 After the quake, Apeiron established a Female Friendly Space (FFF) set in Kathmandu, but which rotated between displacement camps, and a fixed space in Dhading district. 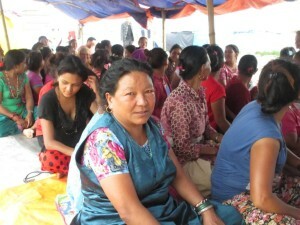 Each FFS varied in size, style and services offered: some organizations adopted existing, undamaged community buildings and designated daily hours during which women and girls could come to rest, chat, eat, drink water, ask a question, report a problem, participate in an organized program, or just take a break from the stress of post-earthquake life. Other FFSs, like Apeiron’s, were simply a tent within displacement sites, displaying a “Female Friendly Space” sign to differentiate their tent from the hundreds of others under which families were living. 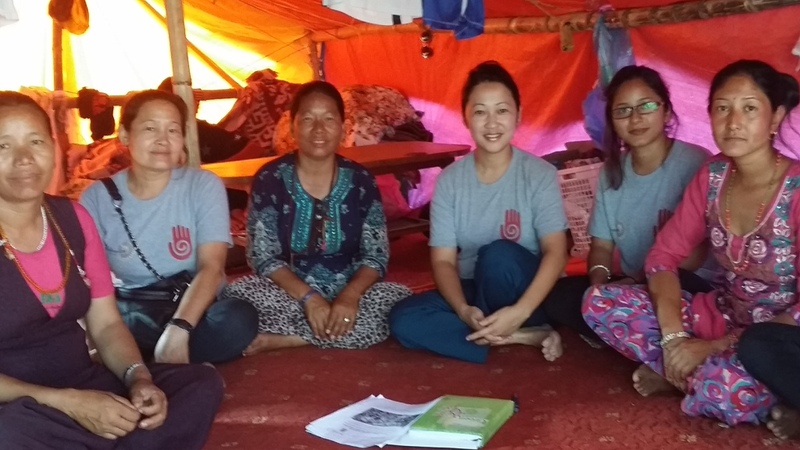 In the tent community that sprung up in Thali in urban Kathmandu and which housed over 600 displaced individuals from hard-hit Sindhupalchok district, Apeiron staff opened their tent daily and tailored their services to the expressed needs of the women and girls who visited. Reproductive health check-ups and skills trainings were common requests. Adolescent girls, for example, expressed the need for after-school activities in their tent communities; away from their homes and usual schedules, they were restless. Apeiron responded by running a week-long sports-based leadership and awareness training program for the girls. After the program, an adolescent participant, Sunita, said, “I feel safe now and aware about me, my body and my rights.” Sunita has kept in touch with Apeiron and recently, she boldly reported the sexual harassment by a group of men in her displacement camp, who have since been scared off by FFS staff and police. In Nepal, OCHA tracked the impact of FFSs in the months after the quake. By June 2015, 42 NGOs reported serving the most-affected districts with gender-sensitive relief activities, including the operation of 82 female friendly spaces, distribution of over 15,000 “dignity kits,” provision of reproductive health services, and establishment of safe shelters for at-risk women and girls. By the end of 2015, nearly 100 FFSs had offered services to over 50,000 women and girls. Individual NGOs also tracked their own impact. At an FFS in Bhaktapur district, six women who took a pickle-making training offered at a FFS said they intended to use their newfound income-generating skill to start a business together. Other women received reproductive and maternal health information for the first time in their lives. After a month of rights-based awareness training by Apeiron in the Thali camp, 84% of women reported knowing who to contact if they experienced physical or sexual violence – an increase from 40% of women there who previously had this information. The earthquake in Nepal highlighted deeply rooted gender inequalities and the varied needs of women and men. 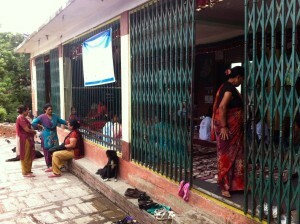 Female Friendly Spaces are just one place in which Nepali women are seeking rehabilitation and recovery, while learning how to wage a longer fight against gender disparities. Fourteen of Nepal’s 75 districts were declared by the government to be “crisis-hit” for the purposes of prioritizing relief efforts. Dignity kits included items that women might struggle to find or afford after a natural disaster, such as sanitary pads, toothbrushes, soap and underwear.